We’d like to hear your thoughts on the current happenings in the MMA world. 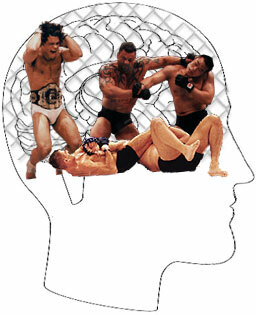 Whatever is on your mind … your thoughts on UFC 67 … Cro Cop and Rampage coming to the UFC, the impact of this on both UFC and Pride … the IFL deal with MyNetworks … EliteXC … BodogFight … the state of the sport today and where you’d like to see it five or ten years from now … whatever you’d like to talk about, we’d like to hear it. The results of the survey and some of the commentary we receive may appear in the upcoming issue of FCF. Canadian MMA fans will be treated to a compelling main event this weekend at TKO 28 "Inevitable", when Mark Hominick (13-5) faces Hatsu Hioki (11-1-1) for the TKO World Featherweight Championship. The bout, which will take place Friday night, February 9th, at the Bell Centre, in Montreal, Quebec, features a rematch of two of the world’s more notable 145 pound fighters. Hioki rendered Hominick unconscious with a second round triangle choke at TKO 25 last May, taking the Team Tompkins’ fighter’s title. The devastating loss caught many off guard at the time, as Hominick had recently made his UFC debut a triumphant one on March 4th, submitting Yves Edwards with a triangle choke. Since his last fight with Hioki, Hominick has won three fights in a row, defeating Samuel Guillet, Doug Edwards and perhaps most notably, Jorge Gurgel at UFN 5 on June 28th. Although Hioki was a not a well known commodity to many MMA fans here in North America when he defeated Hominick, the Japanese fighter had been making waves overseas competing in Shooto. Hioki had a record of 8-1-1 before making his North American debut, a record that also included a win over tough Miletich fighter Joe Pearson in March of 2005. Since his championship win over Hominick at TKO 25, the Japanese fighter has won 3 fights in a row, including a decision victory over Jeff Curran at his Pride Bushido debut last August. There is little question that Hominick will be heavily favored to regain his title if he can keep the fight standing. If Hioki can once again get the fight to the mat similarly to their first encounter, it will be interesting to see how far Hominick’s jiu-jitsu has progressed over the last year. The deciding factor in this fight likely will be each fighter’s wrestling ability, which will determine whether or not the fight remains standing for the majority of the bout, or if it’s spent on the mat. Essentially the same criteria for TKO 28’s main event applies to the bout between Lightweight Champion Sam Stout (10-2-1) and Brazilian Top Team Canada’s head jiu-jitsu instructor, Fabio Holanda (4-4). Stout is of course, similarly to Hominick, highly regarded for his striking skills, which seem to come part in parcel with being a member of Team Tompkins. Although Stout has 6 wins on his record coming way of strikes, the London fighter has likely worked on his ground game considerably since losing to Kenny Florian by rear naked choke at the Ultimate Fighter 3 Finale last June. In his last fight at TKO 27 on September 29th, Stout demonstrated some of his ground skills by submitting Jay Estrada with an armbar in the second round. Holanda has won 4 of 5 fights since dropping down to lightweight competition, holding submission victories over such notable lightweights like Kultar Gill, Blake Fredrickson and Alvin Robinson. Holanda has also been working on his stand up game, but probably has a ways to go yet before he rivals Stout in that range. Once again, it probably will be the wrestling abilities of each fighter that will determine where this bout is fought, and whether or not Stout defends his belt, or the title changes hands. The scheduled TKO welterweight title bout between Steven Vigneault and Jonathan Goulet has been put on hold due to an injury Vigneault incurred in his training camp. Instead, Team Jackson fighter Thomas Schulte (13-5) will head to Montreal to meet up with Jonathan Goulet (16-7). Although Schulte is not a UFC veteran like his opponent Goulet, one would be fool hardy to underestimate any fighter from the highly regarded New Mexico team. Goulet will of course be looking to impress, after going 2-2 so far in his UFC appearances, a win over Schulte will certainly go a long ways to hasten his return to the MMA giant. Some other fights scheduled for TKO 28 include; Chris Clements vs. David Medd, Jason St.Louis taking on Steve Claveau, Samuel Guillet meeting Luke Caudillo, and David Pariseau fighting Martin Grandmont. At last Friday’s Gladiator Fighting Series, Colosseum 4 event that was held in Winnipeg, Manitoba, Rodrigo Munduruca and Chris Fontaine were both able to give their hometown crowd reason to cheer. Middleweight Fontaine submitted Mitch Whitesel with a first round kimura, while BJJ black belt and local instructor Munduruca, also won via a submission, tapping out Rob Smith with a first round armbar. Strikeforce and Elite XC Strike "Strategic Alliance"
MMA promotions Elite XC and Strikeforce announced via a press release today, that an official agreement to co-promote events which feature former UFC Champion Frank Shamrock has been reached. Shamrock is under contract to both organizations, and is scheduled to fight Renzo Gracie this Saturday at Elite XC’s debut event in Southaven, Mississippi, and Phil Baroni on the upcoming April, Strikeforce card. Until this deal was reached this week, there had been speculation that Shamrock’s fight with Gracie might be in jeopardy of being delayed, due to contractual issues. The release stated that the new partnership will begin when Shamrock faces Baroni, as both Elite XC and Strikeforce will be involved in promoting the pay per view event. The February 10th, debut event for Elite XC will be broadcast on Showtime this Saturday, with 5 of the cards fights scheduled to be shown. The event will also be available for Canadian viewers via the Fight Network. In a press release today from the upstart MMA promotion BodogFight, the organization announced the scheduled fights for the upcoming third season of the promotion’s reality television program. Filming of the bouts will begin on February 10th in Costa Rica, and will eventually be available for viewing on the BodogFight website or via ION Television. The current roster of fighters scheduled to compete in BodogFight’s season 3 carries with it some very notable names, including the likes of Jake Shields, Jose "Pele" Landi, Trevor Prangley, Chael Sonnen, and Nick Thompson among several others. BodogFight’s second season which was filmed in St.Petersburg, Russia, recently wrapped filming and is set to air on February 13th, with the season ending pay per view event scheduled for April. Here is the complete list of the scheduled bouts for BodogFight Season 3.